I am constantly inspired by the geometric shapes of Des Moines, Iowa. Over the years, I have taken countless reference photos and work from them. Every time we visit, out comes my camera! Grand Avenue is a direct route leading into downtown. The buildings are familiar, but there is always some kind of new construction going on — changing the silhouette of the skyline. I begin by blocking in large shapes with an 8B pencil very loosely. This will be my starting point after prepping a piece of hardboard with gesso. Once my sketch is done, my next step is gathering my hand-painted papers together and choosing colors. Every so often I spend about a week painting these acrylic papers for each color of my palette so I don’t run out of a certain color during the cutting & assembling process. This can take a while as I mix a wide range of light- and dark-valued hues. My goal is to have many different choices, and I favor using complementary colors. I rarely use earth colors as they seem muddy and dull to me and do not add any sparkle to my paintings. If I do use an earth color, I pair it with a bright color; for example, cadmium red light with a red oxide. I don’t use local colors, but rather saturated, brilliant and bold colors. 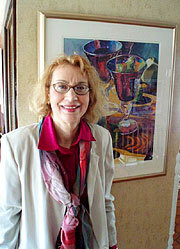 Bright colors characterize my work, in both my collages and watercolor paintings. It was difficult for me to choose the limited colors for this design, but I finally narrowed it down to blues, orange, yellow and gray. Using a limited palette adds harmony and unity — elements of design. I feel that adding a neutral gray next to a bright color makes the whole design sing! A color vibration! There is a bit of perspective added and vehicles leading the viewer’s eye into the picture. Posted in Midwest Life on April 10, 2018.